Parliament has passed a bill presented by the Finance Minister, Seth Terkper that will see an imposition of 17.5 percent tax on selected petroleum products. The Special Petroleum Tax law is part of tax measures adopted by government to increase revenue generation and improve efficiency on revenue collection from petroleum products. The law authorises the Ghana Revenue Authority to collect the tax, which would be paid into the Consolidated Fund. The petroleum products to be affected, according to the Finance Ministry includes: petrol, diesel, liquefied petroleum gas (LPG), natural gas and kerosene. Delivering the budget for the 2015 financial year to Parliament on Wednesday, the Minister presented the bill to the House under a certificate of urgency. The Speaker immediately referred the bill to the Parliament’s Select Committee on Finance the same day after which it was approved by the Committee for the House to consider it. After going through a third reading, the bill was unanimously approved by the Majority in Parliament without the Minority taking part. The Minority had earlier, after engaging in heated debate to make their case against the bill, staged a walk out over the Majority’s insistence to pass the bill. Efforts by the First Deputy Speaker, Ebo Barton Odro, to get the Minority to rescind their decision, yielded no result. The Minority strongly argued the tax will impose further hardships on Ghanaians, who are already suffering the brunt of the economic challenges. NPP Member of Parliament for Sekondi, Paapa Owusu Ankomah told Joy News they had to stage the walk out because no matter how good their argument is, it was not enough to persuade government to take a second look at the decision. “This is not the time to impose this kind of hardship when workers are complaining,” he said. Deputy Minority Leader Dominic Nitiwul stated categorically that the Minority “will go to the streets to ensure that the people of Ghana support us…to ensure that this tax is rejected”. 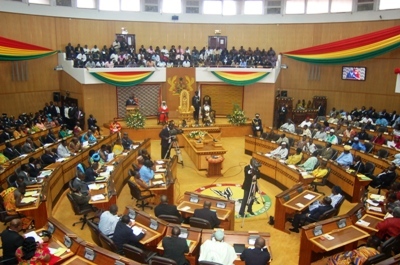 Osei Kyei-Mensa-Bonsu, Minority Leader, described the decision as “appalling” and said the budget, which is supposed to be pro-poor has rather proven that government “doesn’t care about the poor”. But the Majority felt their colleagues on the other side were overblowing the issue, which end result would benefit the nation. The bill was subsequently passed by a one-sided house and the president to assent it today. This means the implementation of the new policy takes effect tomorrow. The tax is expected to lead to marginal price increases in petroleum products at the ex-pump. An amount of about GHc1.541 billion is expected to be realized from the implementation of the tax between November, 2014 and December, 2015. According to the Finance Ministry, the amount would be used to support the implantation of the 2015 budget to meet social interventions goals.